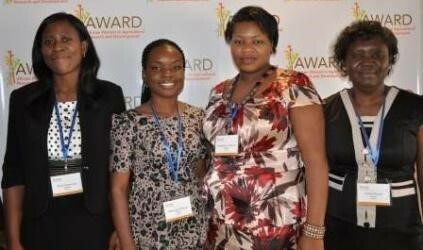 Blessing Adanta Odogwu, a Nigerian PhD student of Plant Breeding and Biotechnology at Makerere University, Uganda, has won the 2014 African Women in Agricultural Research and Development (AWARD) and the 2014 fall Norman Borlaug Leadership Enhancement in Agriculture Programme (LEAP) fellowships. AWARD is a career-development program that equips top women agricultural scientists across sub-Saharan Africa to accelerate agricultural gains by strengthening their research and leadership skills, through tailored fellowships. Fellowships are competitive and awarded on the basis of intellectual merit, leadership capacity, and the potential of the scientist’s research to improve the daily lives of smallholder farmers, especially women. As a fellow, Mrs. Odogwu will benefit from a two-year career-development program focused on fostering mentoring partnerships, building science skills, and developing leadership capacity. 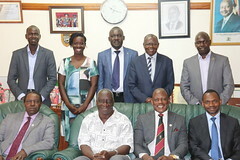 She will be mentored by Dr. Mildred Ochwo-Ssemakula, a Lecturer and Coordinator for Graduate Studies at the School of Agricultural Sciences, Makerere University. Mrs. Odogwu was awarded the Borlaug LEAP Fellowship for her research on Resistance to rust in common bean (Phaseolus vulgaris) in Uganda. The common bean, which has been a major food security crop and source of income to Ugandans for over 4 decades, has experienced decreasing yields in recent years. These yield losses are attributed to abiotic and biotic disease factors that her research aims to quantify and characterize in hopes of identifying sources of resistance. Her mentors are, Dr. James Kelly of Michigan State University, and Dr. Clare Mukankusi of the International Centre for Tropical Agriculture (CIAT), both experienced plant breeders who will assist her with her experiments, analysis, and the evaluation of rust disease in the common bean.